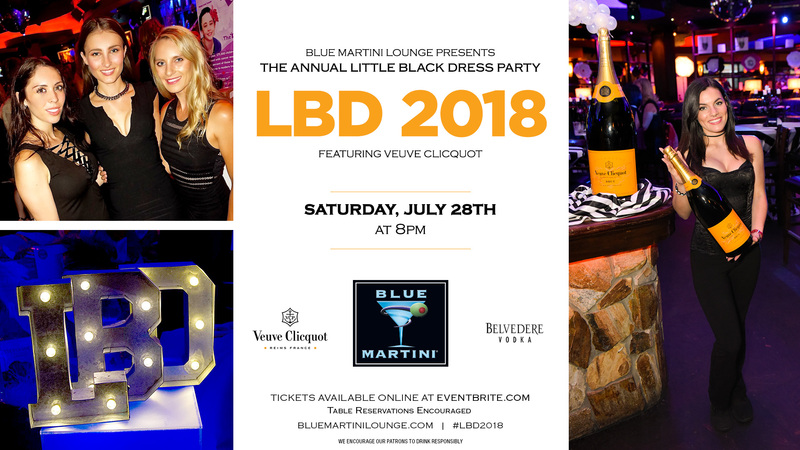 The Annual Little Black Dress Party is back at all Blue Martini locations! On Saturday, July 28th 2018 at 8pm, you’re invited to the most anticipated event of the summer featuring Veuve Clicquot Champagne and Belvedere Vodka! Ladies are invited to join us in their favorite LBD for a chance to win luxurious designer giveaways, enjoy the best in live entertainment, sip champagne and specialty cocktails, while donating to a great cause, our local charity partner. Ladies receive entry into designer raffle for a chance to win luxurious giveaways with charitable donation. Designer giveaways featuring – luxury handbags, designer heels, jewelry, spa and beauty gift certificates, weekend getaways, hotel stays, champagne packages, and much more! Enjoy complimentary champagne, live entertainment at 8pm, event photography, designer raffle giveaways and Veuve Clicquot & Clicquot RICH specials all night! Don’t miss the hottest event of the season – Be sure to #SavetheDate for Saturday, July 28th!